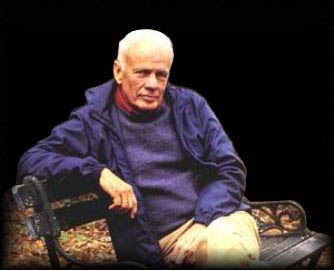 Ruminations on literature, art, politics, music, photography, design (architecture and landscape), wine and spirits &c.
The American novelist Walker Percy became the adopted son of William Alexander Percy, after both his parents died separately (allegedly by their own hands). One of my favorite books is his The Last Gentleman 1966], a story about the contemporary South, one man's search for his lost soul, and the connections between his quest for identity as a Southerner, and the long requiem of Confederate defeat. His first novel, The Moviegoer, won the National Book Award in 1962. 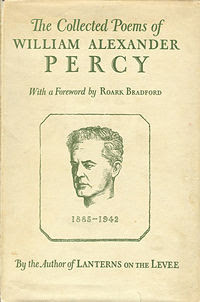 William Alexander Percy was himself a poet of some renown, and the author of a memoir, Lanterns on the Levee . He was regarded as a sort of Southern spiritual-literary father figure to the Fugitives, which included John Crow Ransom, Allen Tate and Robert Penn Warren. 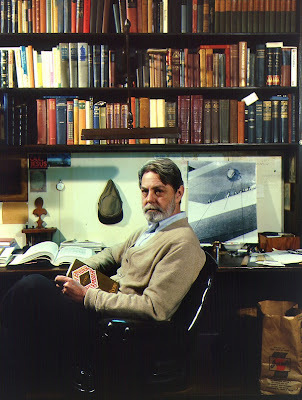 Walker Percy was a boyhood friend with Shelby Foote, the Southern novelist and historian, familiar to viewers of Ken Burns's PBS mini-series The Civil War, as the crusty raconteur of the Confederate officer corps. In honor of both generations of Percys, here are two equatorial inspirations from the cabinet of booze. 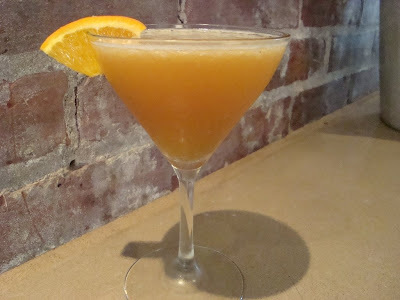 --stirred lightly in ice and served up, perhaps with a very thin slice of honeydew melon dropped in. 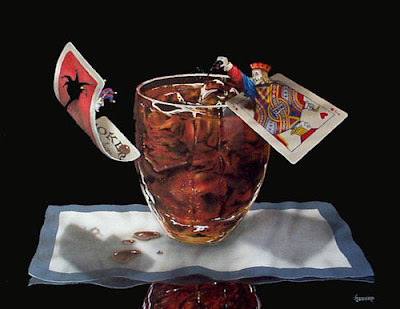 --stirred lightly in ice and served in a tall tumbler, or up, with a thin shave of sweated orange peel dropped in. End of Summer coming. Those hot Southern days. Wandering the French Quarter, or the town square in Savannah in early morning. 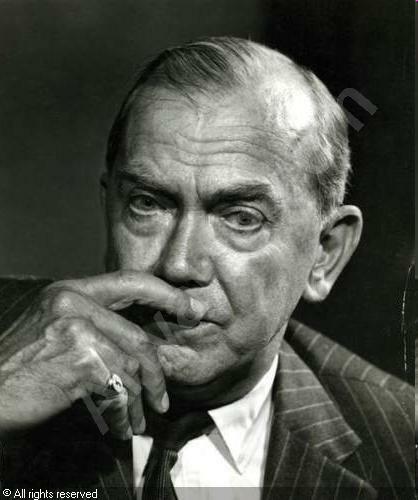 Of all the serious writers about whom one might think to discuss in the context of cinema, few if any have had as much personal interest in film as a medium, and perhaps none have been as successful in a purely literary way, as Graham Greene; or have had the privilege of having so many of their plots and ideas eventually made into movies. Exposure may be a good thing, or it may not, but in Greene's case, the quality of the material has stood the test of time. Writing for film is different than writing for the page. The visual demands are primary--there is no "interior" persona, except perhaps as voice-over narrative--and what develops on the screen has a pace and continuity which does not permit interruption. Old-fashioned serials--no longer employed in the movie-business--might once have been described as episodic, as with chapters, and television may have weekly episodes, but in terms of "first-run" movies, a movie is a single action narrative, which goes non-stop for its entire duration, and can't be easily broken up. It's experienced as a unified, integral sequence. Cinema is an "impatient" medium in this sense, one in which immediacy of effect, and incremental attention to progress and detail, is demanding and unrelenting. Few serious novelists are capable of addressing both mediums--straight or genre fiction, and screenwriting--successfully. But Greene was. 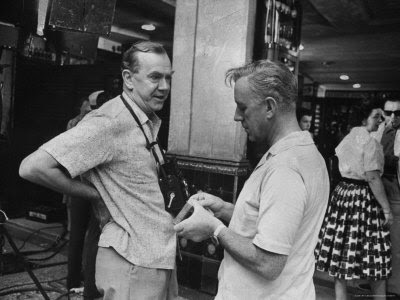 He not only understood cinema, but wrote about it, as well as penning at least five screen-plays [Brighton Rock (1947), The Fallen Idol (1948), The Third Man (1949) (about which I've written earlier), The Comedians (1967), and Our Man in Havana (1959)]. For a good many years, Our Man in Havana was unavailable on the retail video market. That it is now suddenly (to my surprise) available via YouTube [where it can be seen here in eleven episodic segments here thanks to "47johnscott"] is certainly the occasion for celebration, and I see just now that it has become available in DVD, via the Netflix site. I had learned some years back that its re-release in video had been held up for copyright reasons, an odd turn that affects certain older films. Until this week, I hadn't seen it for many years, the last time (I recall) as a rerun on our local PBS television station (KQED). Watching it again just now, I'm swept up in a wave of nostalgia for an era--not so long ago in mental time--when Fidel Castro was a young, optimistic revolutionary, the Cuban Missile Crisis and The Bay of Pigs fiasco hadn't yet happened, and the defining frames of political difference hadn't yet hardened between our government and that of Cuba. 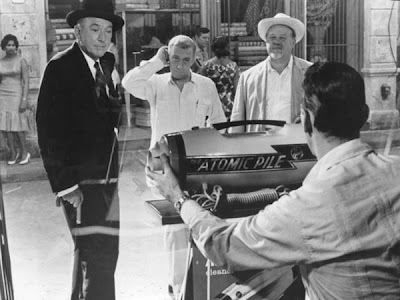 In 1959, things seemed very much in flux in Cuba, and a celebrity film crew might seem as innocent and harmless as a shipment of vacuum cleaners. Not knowing the plot, you might think that Guinness, Coward and Richardson would suggest a prim witty British light comedy, or perhaps a bit of Shakespeare. But Burl Ives? Ernie Kovacs? Maureen O'Hara? Ten years later you might have guessed the sinking of the titanic, or The Towering Inferno. But you'd have been wrong, of course. This group of old pros provided the perfect mix of dignified straight men, absurd caricatures and mildly menacing lurkers which the story required. 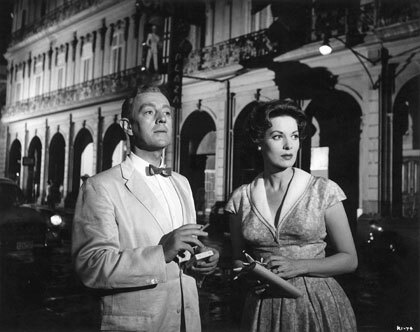 The Cuban Revolution had only been concluded the previous January, when filming began in Havana in 1959. 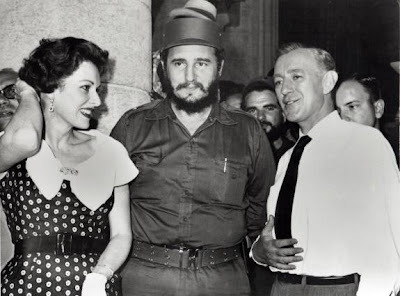 As leader of the revolution, Castro visited the movie set in his signature army fatigues, basking somewhat awkwardly (below) in the spotlight of notoriety, a forum which he would come to occupy over the next four decades. 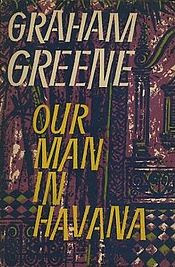 Set in pre-Revolutionary days, Greene's narrative was published first as a novel, which he then adapted to the screen. 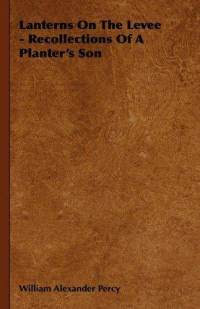 Like many of his "entertainments" (a category of fiction which he assigned to those books which had no putative "serious" content), the book is basically a comedy, but with more probing undercurrents of implication. The outposts of British occupation (both literal and metaphorical--the "Greenelands" of the globe) were his special setting, where, contrasted against foreign backdrops and cultural exotics, his British or American protagonists could be seen in dramatic relief. A Catholic, and even, for a time, an official functionary for British intelligence (MI-5), Greene suffered from bi-polar disorder, and nervously moved around the world in search of material, and for personal interest. Though English to the core, he seems to have felt most comfortable as a traveler abroad, living on the edge of things. Exile and disillusionment seem like a familiar states of mind in Greene, and Our Man in Havana contains all these qualities. Too, absurdity and comic sarcasm find their way into his plots, and into this movie as well. The late 1950's was also a significant period for the Cold War, then at its height, which had seen the launching of the Sputnik satellite by the Soviet Union in 1957, bringing into question the technological superiority of the West, and drawing increased attention to sophisticated weaponry, surreptitious intelligence gathering, and our paranoia about the Communist menace around the world, particularly--as we would shortly experience it first-hand--in our own Western Hemisphere. Bombs, rockets, spying and spy-craft--they were big subjects, then, high in the order of our preoccupations (and fears). All this, again, may seem like very old history, but at the time, these were present realities, just unfolding, timely and relevant. Greene's story plays upon all these themes, albeit with comic irony. 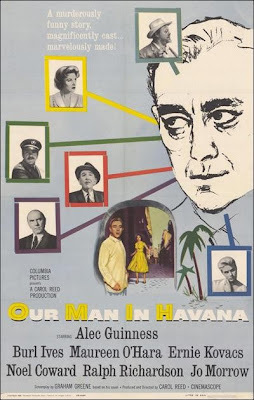 In pre-revolutionary Havana (Cuba), a backwater of the Cold War, an Englishman (James Wormold, played by Alec Guinness) running a small vacuum cleaner shop (no explanation is given as to how he happens to be in Cuba) is approached by a "stiff upper lip" functionary of the British Secret Service (Hawthorne, played by Noel Coward) in the Caribbean (he's posted to Kingston, Jamaica (a British colony then, it achieved independence in 1962)), and asked to become a paid spy operative. Wormold ("old worm" or "worm mould" or "war mold") leads an uneventful life, tending to his shop, taking afternoon cocktails with his friend--another exile--a German doctor (Dr. Hasselbacher, played by Burl Ives), and trying to support the extravagant tastes of his attractive blonde daughter Milly (played by Jo Morrow). Meanwhile, Captain Segura, feared as the "Red Vulture" of the Cuban police militia, has eyes for Milly. Wormold needs money to support Milly's purchase of a thoroughbred jumping horse, and membership in the local country club, etc., so is susceptible to Hawthorne's offer of easy money to run the spy operation. Clueless as to how to proceed, he asks his old friend Hasselbach, who suggests that he simply invent a network, and the intelligence it provides. In short order, Hawthorne is encouraged by his superiors to promote the operation by sending a "secretary" (Beatrice Severn, played by Maureen O'Hara, and her assistant) to assist him in setting things up. To make things interesting, Wormold invents fake intelligence of a secret weapons site high in the mountains. (Understand that this was well before the discovery of Russian ICBM's in Cuba. How could Greene have guessed this future history? How prescient!) He tells Milly that he's writing a science fiction story, and the drawing he's making of the imaginary "weapon" is to illustrate it. By the time Hawthorne reports the early progress of his recruitment of Wormold in London, both he and his superiors have begun to suspect that Wormold is nothing but a fraud, playing along by inventing stories to please his superiors--his drawings of the "atomic pile" device resembling nothing so much as a moderne vacuum cleaner!! And yet, as if reluctant to admit their own incompetence and credulity, they refuse to act on their own suspicions, forging ahead, and widening the area of Wormold's excavations. The absurdity of all this is not lost on the audience. Well-versed in the hocus-pokus of spy "trade-craft" from the world of fiction and cinema, it knows all too well about the familiar machinations of intrigue. No sooner does Wormold invent a plot--based on a cartoon he sees in the newspaper--to have a Cuban pilot shot down attempting to secure more aerial photos of the "weaponry" he has created, than reality trumps fantasy, and a "real" pilot is shot down over the mountains in suspicious circumstances. This convenient deus ex machina lifts the plot further out of improbable comic roman into the realm of virtual science fiction. Not only is Wormold playing his handlers, but his handlers (MI-5) seem perfectly content to "run" a bogus spy network as long as no one dares to blow the whistle; and, as Wormold's fantasies begin to seem like the conjuring of fate, there is the uncomfortable sensation of being manipulated, as if the whole plot were indeed like a movie imagined by British Intelligence. But reality becomes increasingly uncooperative. No sooner does Wormold's imaginary plot come to frightening life, than a new sub-plot springs up, in which some ghostly faction appears, threatening Wormold's life. 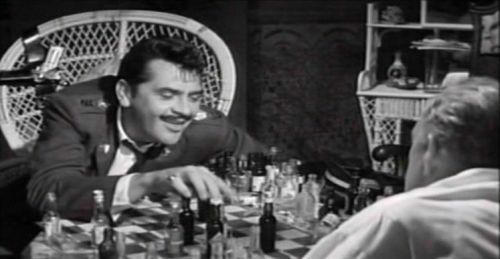 By this point, not only does MI-5 realize how precarious Wormold's machinations have become, but the Cuban authorities, in the person of Captain Segura (Ernie Kovacs), have begun to figure out some of the mischief he has been making. Were it not for Segura's attraction to Milly, he would almost certainly have detained Wormold, if not deported him outright back to England. In a weird sub-plot, Hasselbach is suborned by the ghostly anonymous faction to spy on Wormold, and then is inexplicably murdered in the street. At a business lunch, Wormold learns that Macdougal, posing as another appliance salesman, is stalking him. In the metaphorical set-piece of the story, Segura challenges Wormold to a game of checkers. One of Wormold's hobbies is collecting souvenir miniature bottles of liquor. The two decide to play their game using alternate little bottles of scotch and bourbon. As each "takes" an opponent's piece, he must drink the captured bottle. In this way, Wormold arranges to let Segura "win" enough to drink himself into a deep sleep. Borrowing Segura's white-handled service revolver, he lights out into the night and meets his espionage counterpart, MacDougal, for drinks. Both men, realizing they're bent on each other's demise, finding themselves in a shady arcade before a whorehouse door, shoot it out, Wormold killing him with uncommon cool efficiency. Finally, Segura, realizing his chances of marrying Milly are nil, decides instead to deport Wormold. Fully expecting to be jailed, or even hung, for treasonous acts against the Crown, Wormold walks into his meeting with the head of MI-5, expecting the worst. In the ultimate irony, 'C' (played by Ralph Richardson) informs Wormold that he's been chosen for a meritorious service decoration and is to be given an office, and assigned to train personnel in how to run a field office operation. Beatrice Severn and Wormold (who seem to have fallen in love) walk off down a London street, Milly in toe, to closing credits. Though the story is clearly a comedy, people die, and a great amount of energy is expended to no particular purpose, save pointless intrigue and much ado about nothing. The targets of Greene's satire are clearly the self-important and incompetent strategists of Western bureaucracies, particularly their bankrupt "efficiency" and investment in appearances instead of verifiable data. Caught up in their own intrepid maneuvering, they manage to bring about the death of three people, and cover their own tracks by quietly burying the whole affair. The deeper irony, of course, is the absurdity of those deaths, when measured against very real problems of the world. Insulated from the social and political realities of the world they see as their plaything, the British Secret Service engages in quixotic jousts, seducing innocents into play as ciphers in their grand game. 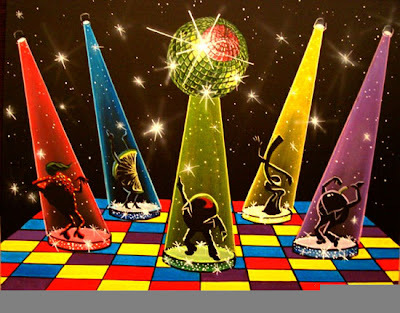 The surreal checkers match between Wormold and Segura may stand for the whole metaphoric "rules of the game" which animates the players, and raises them out of the drudgery of the quotidian into the glamor of official artifice. For Greene, once an amateur agent himself, during World War II, the trappings of pretentious intrigue must have seemed an absurd indulgence when measured against the temptations of Third World disorder. As a Catholic, the personal code of honor and virtue which his faith offered, guaranteed that his view of the rational options available would lead inevitably to the solitary individual, absolved of all formal duty or obligation, at the deepest levels of character. In Wormold, we can see the dilemma of a man for whom personal priorities are as persuasive as national pride. Separated from its context, adrift in an alien (Latin) culture, patriotic feeling may lose its meaning. In the ultimate test of faith and allegience, Wormold chooses family (his daughter's welfare), and love (his feeling for Beatrice), over truth and honor. This is the choice I outlined in an earlier blog essay "Friendship & Love". The Greene quotation I referenced there--"If you have to earn a living...and the price they make you pay is loyalty, be a double agent--and never let either of the two sides know your real name"--is a key to his tortured conscience, "referring to the allegiance which an individual makes, privately, to himself. It assumes that such oaths and vows are by their nature secret, never divulged, and that by maintaining a sort of "neutral" ground--a personal code of non-commitment--one may save one's moral soul by never truly (to one's self) taking sides. This kind of alienation from outward forms of connection is typical in the modern world, since it accepts as a given that we all have private lives which are distinct and separate from our existence in the everyday world. It's explicitly immoral, or morally ambiguous, since it sets the individual ethically apart from an expressed, committed choice. Each individual is therefore free to maintain a private code. A private code implies a degree of freedom, a core of sensibility which is impenetrable, even under torture, or extreme temptation." Like The Third Man, Our Man in Havana is the portrayal of an individual set amidst the chaos of betrayals and corruptions of the actual world, trying to navigate a pathway fraught with temptations, mysteries, and dangers. In the wider irony of the realities of the time, Our Man in Havana ended up being a cautionary tale about the self-deception of America's anxieties regarding those threats--both real and imagined--throughout Central and South America, in the succeeding decades. Mere individuals can do little--if anything--to effect the outcome of larger events. Greene seems to be saying that notions of importance we assign to specific moral acts are mere illusions, if seen from their true perspectives. Personal safety and commitments must dictate our behavior, since that is all, in the end, we truly have. Watching this film again is a nostalgic experience for me. I probably saw it soon after its initial release date, in 1959 or '60, when the events of that year--Castro's triumphant revolution--were fresh in the news. Ernie Kovacs died only three years later in an auto accident, a sad loss to American cinema and television. The story would be Greene's last "entertainment." 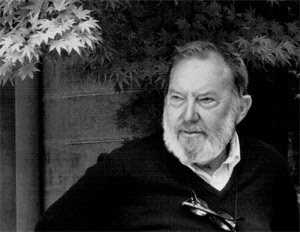 Few writers of "crime" or "espionage" or "thriller" genres have had Greene's sense of humor or irony. We seem to see the world as more black and white. Let's hope they don't try to colorize this fine film; it's just fine like it is. The success of the recent ballet film Black Swan  has inspired references to an earlier version of the same basic thematic trope--pertinently, the classic British production The Red Shoes . Though the latter film is somewhat more ambitious and pointed in its use of the story-within-a-story conceit, clearly both efforts are based on it, and each plays off the cliché of the tragic principle ballerina role whose real life fate is entwined with the fictional dramatization of the stage piece which symbolizes her dilemma, and eventual artistic triumph or downfall. I saw Black Swan when it came out a few months ago, and it's a competent work, using special effects to good purpose, but it seemed a trifle predictable and derivative--especially of that earlier film. Films we see in our impressionable childhoods may have an inexplicable power over us, as if they had somehow happened in reality. As we grow older, we are less able to perceive dramatic actions as vividly and immediately as we did in childhood, when our consciousness--the proscenium, as it were, of our awareness--apprehends things as larger than life--or as life itself. Which is not to suggest that we aren't sensible of the pretend nature of art, only that experiencing it then, occurs almost as actual real-time experience, and on an emotional par with it. My mother took me to see The Red Shoes in a theater when I only 5 years old. I was her only child, then, and it was not anticipated that I would ever have any siblings. My mother tended to experience things only from a feminine point of view, and her projection of it, channeled through her own frustrations and dreams, her confused and resentful sexual nature, was expressed as a desire to make me the instrument of those projections. I have no doubt that she would have preferred to have a daughter, instead of a boy. She preferred always to buy "girls" toys and clothing for me, and was frustrated that I didn't accede to these talismans of her dream-life. As I grew older, I had the distinct sensation that she wished that I would become homosexual, as that would in some way remove me from the heterosexual context which she resented, but felt powerless to influence, or to act out, in her own life. Even now, almost 60 years later, I can still feel a vague memory of the faint sexual embarrassment I experienced, watching that magical movie, The Red Shoes. It was a troubling experience, but a formative one. In retrospect, I can bless my stars for having been given this experience at that age, though for purposes and reasons that surely weren't mine. She would have said, then, that taking me to a movie like this was a part of my education, in the Victorian sense, just as my later church-going and little league baseball participation were intended to teach me crucial lessons of life. As a boy, I grew up thinking of ballet as an effeminate pastime, one dominated by limp-wristed queens and jealous prima donnas, graceful, over-refined and emotionally pathetic. By all accounts, a pretty naive attitude, but typical of the lower middle-class culture in which we lived. I couldn't have told you this in so many words, then, obviously, but I certainly felt it at that level. The symbolic importance of red shoes in cinema is well-established. 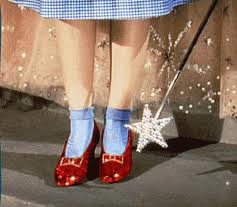 Dorothy's ruby slippers in The Wizard of Oz [1939--only 9 years earlier] had glowed with the same sort of preternatural intensity in memory. Indeed, the power of shoes--or slippers--or dancing shoes--to propel the wearer, or to impart magical powers, or to lead the wearer into an irresistible (even tragic) destiny--seemed like the stuff of fairy-tales, as indeed they were. 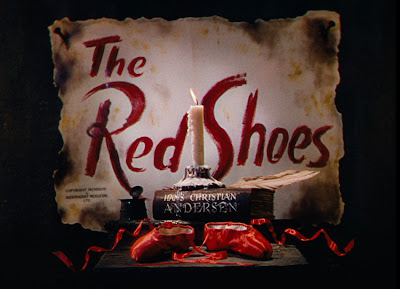 Both movies were adaptations of juvenile fictional models--The Red Shoes having been originally a Hans Christian Andersen story. 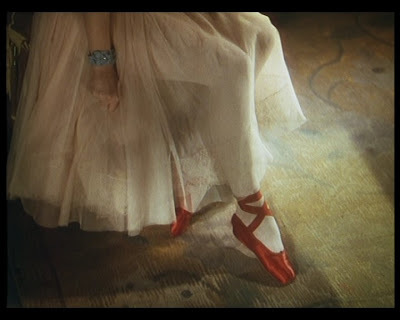 The first time we see the red shoes in the ballet episode, they appear to glimmer in the spotlights, in the shop window of the old shoemaker, and the moment Shearer puts them on, she flies into irrepressible motion. Red shoes are clearly magic. Certainly it was no single aspect of the production which moved me at age 5, but the overall effect of all the elements--the music, the color, the costumes, the dramatic fantasy, the severe theatrically drawn characterizations. I could not have said then what effect these aspects could, or would have, on me, but they entered my subconscious mind, indelibly imprinting my memory, and doubtless determining, or at least influencing, my character forever. 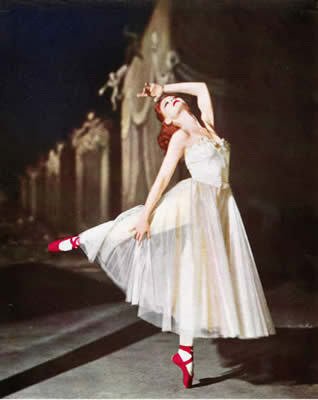 The Red Shoes has been interpreted, naturally enough, as a fictional fantasy upon the Diaghilev Ballet Russe Company. The myth of the "ruthless" "imperious" impresario, bent upon artistic fame, who manipulates and abuses the members of his company, is fully realized in the figure of Boris Lermontov, the parallel character in the film (played with panache and arch slyness by Anton Walbrook). Lermontov draws the unsuspecting aspiring ballerina into collaboration with his new composer discovery Julian Craster (played with romantic dash by Marius Goring), with stock parts going to Ludmilla Tchérina (as the retiring female lead Boronskaja), and Léonide Massine (basically as himself--who had once been Nijinsky's replacement in the original Ballet Russe). In another frame of life imitating art, the part of the tragic heroine, Victoria Page, is played by a professional ballet dancer, completely untrained for acting, Moira Shearer, whom the producers of the film--Michael Powell and Emeric Pressburger--had had some difficulty in persuading to do the part at all. She had never acted before, and was in the beginning stages of a serious career in ballet when she was fingered for the part in Red Shoes. In the accounts I've read, there's a little of the devil's mistress flavor to the whole affair--Shearer herself was nothing if not unambiguous: "If I am dubious about films and film people; the film industry has only itself to blame. I have been asked to play Shakespeare. Other parts include a Bernard Shaw play and a classic previously made by one of the screen's finest actresses. It would be ludicrous for me to try to play any of these parts. I am not an actress. What people cannot realize is that a ballet dancer just cannot afford to give up ballet for a moment. After a month without practising you are thrown back years. 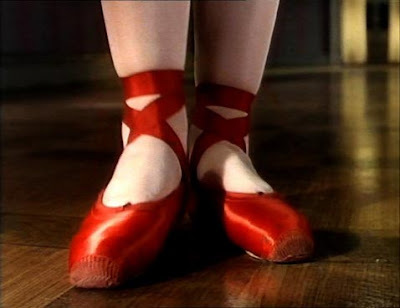 Isn't it strange that something you've never really wanted to do turns out to be the very thing that's given you a name and identity?...The Red Shoes (1948) ruined my career in the ballet. They [her peers] never trusted me again." Shearer continued to dance professionally until 1953, when she gave it up following an injury. She was offered parts opposite Fred Astaire in Royal Wedding , and with Gene Kelly in Brigadoon , but she turned them both down. It may be hard for us to understand why the lady did complain so much, but it was a different time--before television, and before movies had become so much more important (and lucrative) a career than the legitimate theater or classical dance. The framing device which I mentioned above works this way: the impresario Lermontov figure's counterpart is held by the shoemaker in the ballet. Each intends to guide and control his "muse" as the puppeteer his puppet. In the ballet, this results in the death of the muse. 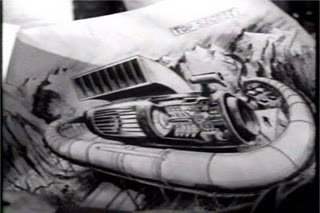 In the movie, it results in the muse's suicide. In the wider frame of the making of the movie itself, Shearer's dancing career is compromised by her choice to act instead of pursuing her first calling. In the movie, an affair between Victoria Paige and the composer Julian Craster results in Paige's firing by Lermontov, driving the two lovers together. Craster occupies, ironically enough, the same symbolic position as Lermontov, since it is his "lyricism" (his score, for the ballet) that "seduces" Paige--in fact, they are competing seducers of her soul. Exiled from the company which gave their lives meaning, the lovers yearn for a reinstatement by the imperious and temperamental Lermontov. 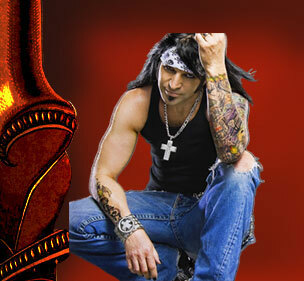 Eventually, he prevails upon Vicky to resume her position with the company and to dance The Red Shoes again. In the culmination of the narrative, on the eve of her performance, simultaneously with the concurrent debut of Craster's new opera at Covent Garden--the two men vie for her favor--Craster begging her to leave the company, and Lermontov insisting she choose art over love. Vicky, devastated and conflicted by the choice, dressed in her outfit (with the shoes), and preparing uncertainly for her stage entrance, is seized by despair, and flees instead out of the theater, jumping off a balcony onto the tracks before a churning train-engine. Craster holds the dying Vicky in his arms as she tells him to "remove the red shoes" from her feet. Lermontov, fighting back grief and frustration, announces to the audience at curtain-time that he will present the whole ballet without her, her part "empty" in the spotlight--the dancers pretending she's present. The melodramatic symbolism of it all is quite over the top, in a Forties kind of way, but to a child, responding to the very fairy-tale structure of the narrative, such mechanisms are the stuff of dreams. Indeed, the whole movie is a grand, if simple, conceit told in terms of a romanticized contemporary setting. What I would take away from the movie upon my first seeing it were just a few visual queues: The red shoes themselves, glimmering in the throbbing footlights, Vicky Paige's washed-out red-haired ghostly presence--her hysterical mask at the moment of terror, Craster's adolescent impulsiveness, Lermontov's poisonous glances, Massine's (the Shoemaker of the ballet) macabre, malign mugging violation, etc. Today I would notice, for instance, the premonition of Craster and Paige standing on a balcony overlooking the train tracks which occurs earlier in the movie; or the more subtle manipulations of Lermontov to engineer Vicky back to his company--the sort of things a childhood mind would be incapable of comprehending. I think what affected me most deeply then was Vicky's perilous vulnerability and mercurial evanescence in the face of the demands of performance, which of course is the motive-force of the narrative--to be both the object of affection and the victim of it simultaneously. The melodramatic fatalism of that paradigm will always have a strong appeal with audiences. 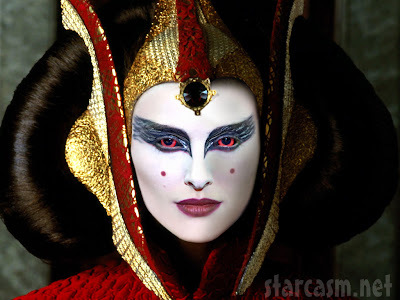 I wonder how I would react today, if I were able to see Black Swan at the same age I'd seen The Red Shoes. I suppose the effect would be quite similar--the more graphic imagery of the later film, with the self-wounding, the delusional fantasies turned into visual animation, the demonic possession, the feminine vulnerability, the scheming, sexual predator-head-choreographer, etc. 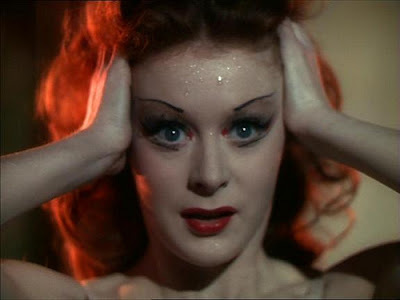 The Red Shoes is a masterpiece of cinema. The choreography, the score, the perfect casting, the tight script, the magnificent color. Within the multiple frames--actual movie production, the movie itself, ballet within movie--the theme of the muse seduced into compliance, as love object, puppet-master's apprentice, and tragic heroine, both love- and star-crossed, makes for an unforgettable experience. Initially under-appreciated by audiences, it eventually went on to great popularity, much as The Wizard of Oz did, becoming a classic of its kind, and for much the same reasons. It's in my top 20, for sure. Wikipedia entry for The Red Shoes. IMDb entry for The Red Shoes. 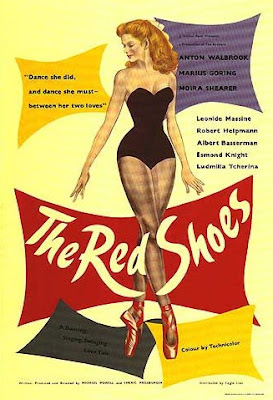 The whole film of The Red Shoes can be viewed online on YouTube, under the RS1-13 sequence uploaded by RobinSena23344 in July 2010--from this URL forward. 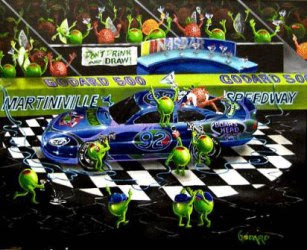 Michael Godard is that quintessential quantity, a bad artist--the kind who succeeds by appealing to the lowest aesthetic instincts imaginable. Arising from the milieu of Southern California, Godard was typically unsuccessful in other occupations--engineer, illustrator, caricature artist, and allegedly had a difficult childhood, and a troubled family life (a chronically ill daughter who died young). 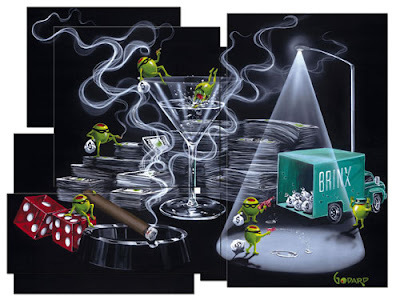 His signal success in creating cartoon-like canvases of high contrast polish and comic thematic content has redeemed an outlaw personality and brought him into the mainstream of successful pop art. Is it possible for an artist to be so successfully "bad" that the work flips over into genuine quality--in effect, transcending the usual categories and genres to occupy a place that has integrity because of its honest, straightforward meretriciousness? It may be so. I'm not a serious art critic, and I often think I'm on uncertain ground when trying to estimate the value and quality of modern art. Was Rothko a genius, or a charlatan? Was Warhol great, or just an audacious advertising executive? I don't have any clear ideas about that. I often despise bad art--for instance, the work of Norman Rockwell, which makes me feel I've been drenched in sewer water every time I see one of his canvases--probably for the right reasons, but then I encounter an artist who breaks all the rules, and still manages to communicate something to many people. Godard, mind you, is no golden-hearted, modest craftsman, toiling away in obscurity and proud indignation. He's a no-holds-barred self-promoter who pushes himself and his work forward with undisguised vanity and ambition. In America, cartoonists have often attained the rank of serious artist. Charles Schultz, for instance, or Walt Disney built very lucrative careers, veritable marketing empires, out of a few simple comic strip narratives. We certainly don't measure the aesthetic quality of them against the yardsticks we use to judge, say, Monet, or Winslow Homer, or Lucien Freud. Everyone acknowledges that various media entertainments may, through their popular appeal, achieve a degree of recognition that tends to raise our estimation of their value to levels that rival "serious" art. It's not a new thing. And each new generation of avant garde artists routinely gets vilified for, in effect, dissing the traditions of devotion and quality and performance which set previous standards of taste. Taste is a funny thing. In our nervously shifting world of art values, wayward or eccentric figures may appear briefly, their propulsive rockets filling the night sky with color and pizzazz, only to fizzle out after a few years of high sales and whipped-up excitement. Every so often, you'll see road-side stands of black velvet paintings, which people who travel in motorhomes seem to find enticing. Unsophisticated taste in art has a long and undistinguished history in America. But what is it about the success of a minor cartoon artist, that should so offend our sensibilities? Colin David unburdens himself of a stern indignation in his undated "Michael Godard: Worst Artist in the World." Mr. David condemns Godard for his poor technique--getting the shadows wrong--and his showmanship. But when we're dealing with a generic art that admittedly doesn't aspire to higher values, what is the point of such criticisms? Is it all just sour grapes? 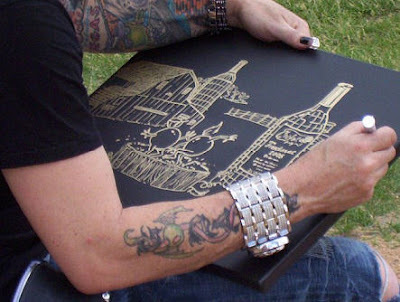 Few artists are able to make a living of any kind with their own work. 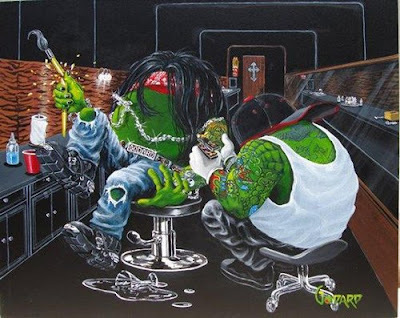 Many teach, or hold day-jobs, or just scumble along, either hoping for a break, or imagining that someday their work will emerge from the obscurity of the quotidian to stand forth as hypnotic images of our epoch. But this seldom happens. So why should it bother us, when someone overcomes the large resistance to artistic acceptance, and actually manages to make a living selling pictures or objects to people for significant money? It may be envy, or it may be genuine scorn--feeling as if the rewards of aesthetic effort ought to fit some higher standard of taste and function. But who shall decide what those standards of taste should be? Van Gogh may command prices in the hundreds of millions of dollars for individual canvases. But does this necessarily imply that all art, in any context, should aspire to this level of import? "People like what they like," and why not? What should prevent the ordinary householder from buying an oil painting at an artist's fair to place over his mantel? In what sense is this a desecration of the public's respectability? 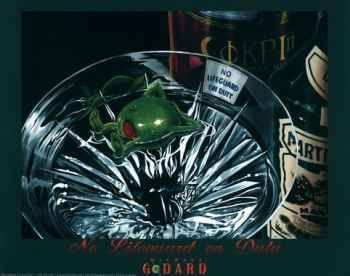 I look at Michael Godard's works as a form of sophisticated cartooning. They probably belong in the lounges of Las Vegas, or in the livingrooms of the not very sophisticated Hollywood stars who "know what they like," and "don't give a damn what anyone thinks." 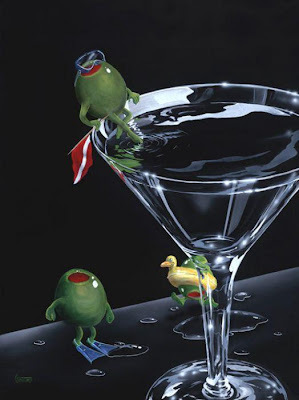 I could imagine them in an animated state, and certainly the digital animation technology could do wonders with them--these little green olive characters getting into all kinds of mischief. The glorification of alcoholic beverages, which they clearly embody, seems to me merely a minor fetish, which is really unnecessary to the spirit they capture. In what sense, then, are these works less ennobling or uplifting than a Ralph Steadman cartoon, or a Ronald Searle drawing, or a piece by Edward Gorey? Are we so categorical that we are only able to see humor if it is aimed at the correct target, or addresses the acceptable problem, or manipulates the permitted subject? Steadman may parody book collecting or wine tasting; Searle may satirize British public schools; and Gorey may vamp with the late Victorian Gothic. But woe be to the Los Angeleno biker stud who fantasizes about olives climbing out of cocktail glasses into the fantasy world of casinos, noir heists, and tropical getaways. 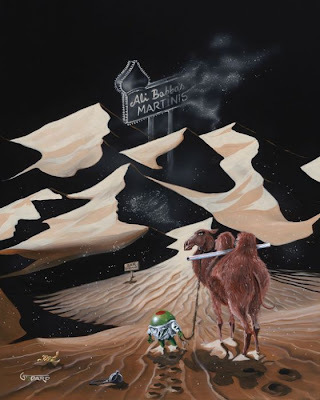 "The Straw That Broke the Camel's Back"
As probable substitutions for the things most people will never own, or probably never see first-hand, up-close, secondary art occupies an important niche. To imagine the world into art is a completely human aptitude, which is expressed all up and down the spectrum of class, education and interest. Who's to say Michael Godard is either worthless, or misguided, or unworthy? Most people got a good kick out of the dancing raisins singin' "Heard it on the Grape Vine" a few years ago on commercial television. And those little peanut M&M's diving into a chocolate swimming pool--they were fun too. 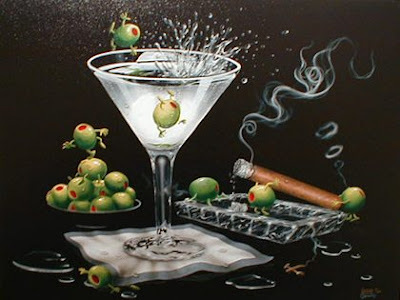 I'm rootin' for these little olives in their inebriated escapades, but I have no illusions about quality. We'll leave that to the highbrow critics who roll their eyes and clear their throats. 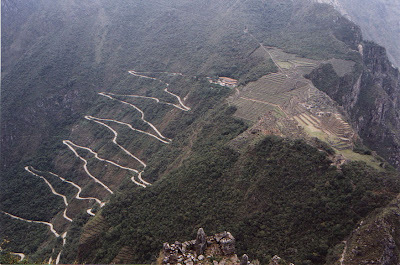 The shortest route between two points is a straight line. But sometimes the shortest route is interrupted by obstacles. In life, we often find we have to go around something which we can't scale or overcome initially. Patience may be in order, or simple common sense. Why knock yourself out if you have alternatives? Other times, capitulating to the inevitable is the only choice. People who can't compromise will have difficult lives. But meeting challenges is crucial to success, too. You have to pick your spots. Sometimes, taking a slight detour is the only way to overcome a larger obstacle which would be too circuitous to go around. There are different plateaus. Calling something crooked has implications. 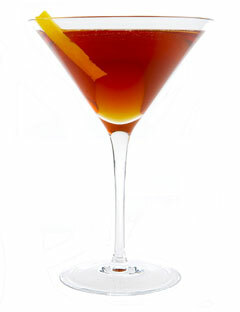 I'd never call a drink "The Zig-Zag"--which implies an inherent contradiction. Tastes have to make sense on the palate. The shortest route in a concoction seems better. Consistency, alignment, forthright determination--the right mix. Shaken gently (or swished) and served up. The shortest distance between two points may not always be a straight line. So kick back and enjoy a moment of reflection, and rest up for the next challenge. Decide upon the best strategy, and the best route to your destination. And when the time comes, be ready. 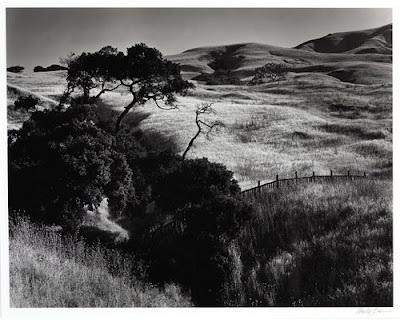 Morley Baer [1916-1995] was a Bay Area resident and professional photographer for fifty years. I first became aware of his work in the early 1980's. His black and white landscape photographs were being published in monographs, and he had achieved notoriety for his color work in Painted Ladies--San Francisco's Resplendent Victorians [Dutton, 1978], which recorded the garishly repainted late Victorian--post-earthquake--architectural follies, in vivid Kodachrome (or Ektachrome). 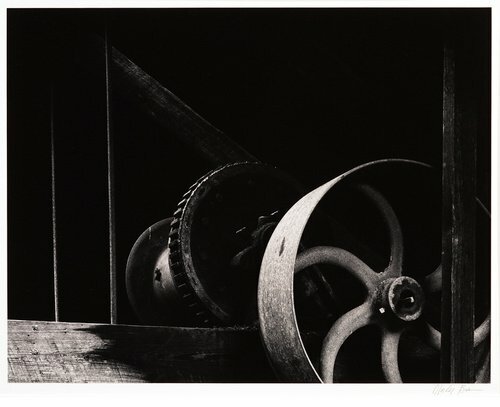 Baer had begun his professional career as an architectural photographer in the late 1940's. Like Brett Weston, he'd done a turn in the military working as a service documentarian, before finally settling in the Bay area in the early 1950's. 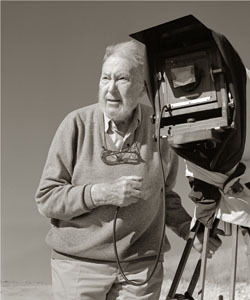 Baer eventually established a reputation as one of the top architectural photographers, working with William Wurster, William Turnbull and many other notable regional designers. His images of the built environment are widely published in that field. 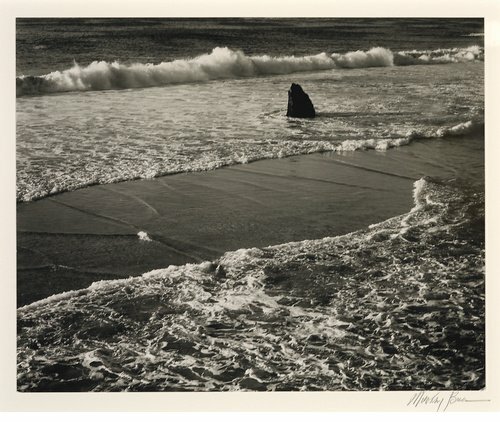 Concurrently with his architectural work, Baer was also interested in landscape imagery. He early connected with Edward Weston, and fell in love with the same West Coast scenery which had inspired the Westons (Brett, Edward and Cole) , and many others during the immediate post-War period. 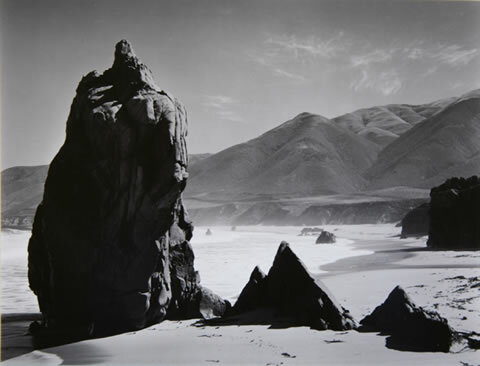 Baer assisted in the printing of the limited original Edward Weston print portfolios. 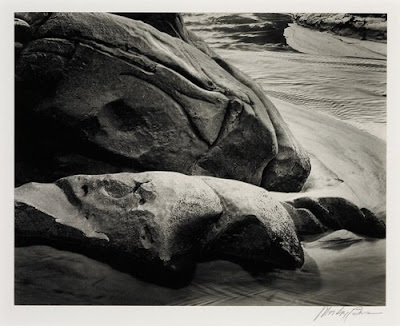 As his interest in artistic landscape work increased, he was drawn to the Central Coast area around Carmel, and in 1965 he moved into a beautiful stone beach mansion on Garrapata Beach--designed for him by Wurster. 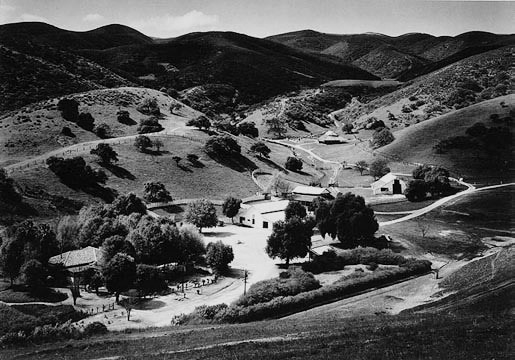 Baer, using the beach house as a base of operations, lived there until 1979, when he sold it to resume living with his wife at another house in the Carmel Valley, where they lived for the rest of their lives. 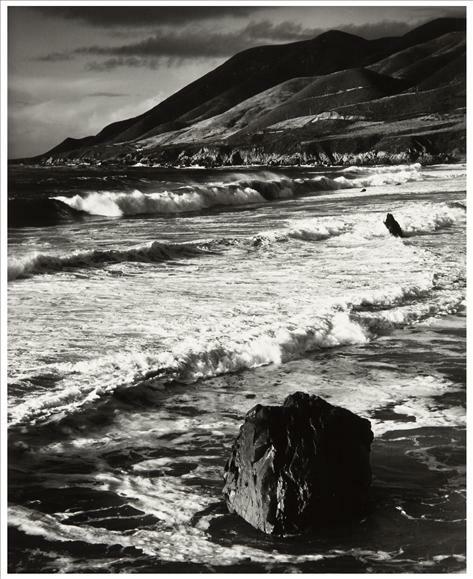 In his later years, Baer taught workshops, and saw his reputation grow along with the recognition of the West Coast photography movement of which he had been a major figure. Preferring an 8x10 view camera for most of his serious work, Baer established a personal style that derived in part from Edward Weston's and Ansel Adams's landscape work, but he brought to it a certain elegance and finish that set it apart. Aside from his straight architectural commissions, Baer was interested in the architecture of barns, the rolling oaky hills, and spent time in Spain and Italy working on classical subject matter as well. 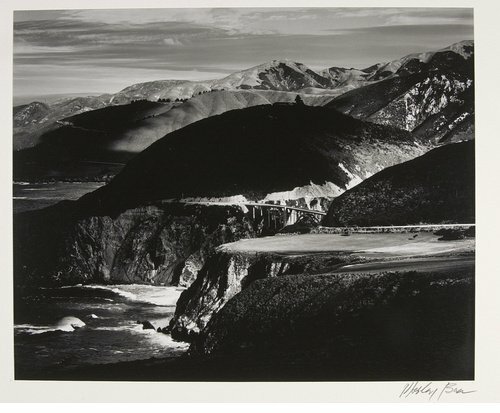 I've always loved his studies of the coastal foothills, which though not being entirely "heroic" (in the manner of Adams) nevertheless have a dignity and austere picturesque quality I find very attractive. He also worked in the Southwest, exploring the native pueblo and church architecture, seen here in this gaunt, metaphysical study of an adobe wall and curved ladder arching into an eerily empty sky. 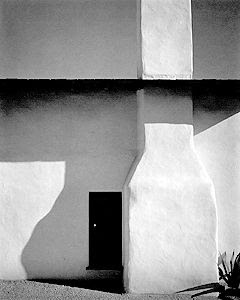 The same kind of aesthetically discrete approach characterizes this study of a Spanish colonial architectural detail of a chimney, door and roof-line. Keeping the roof-line level with the point-of-view allows the composition to be neatly divided between the shadowed wall underneath the overhang, and the slightly darker grey sky above. 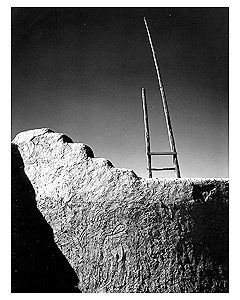 There's a sculptural purity about this study of another Southwest structure, the high contrast hard sunlight emphasizing the heavy solidity and mass of the battered stone construction. 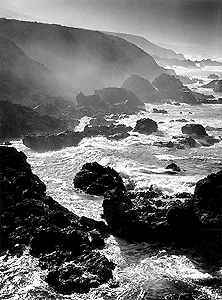 One aspect of the dramatic West Coastline is the foam and spray which rise into the atmosphere around the crashing surf and rocky shingle. 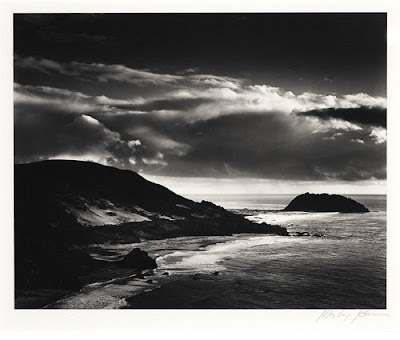 Baer captures this coastal "fog" or mist interposed against the distance shoulders of land, heightening the effect of the glittering droplets of sparkle and fizz. You can really feel the wet and coolness of the interaction. The effect here--of opposing surf waves--possible where a fresh-water stream meets the oncoming waves, creates a christening quality, where the two currents will intersect and merge into one. It's a delicacy for the eye, like sunny lace curtains in the breeze. The rock, meanwhile, anchors the composition. We're looking at a diagonal vantage to the scene, so that rock sets up a perspective definition that keeps the eye level and oriented. 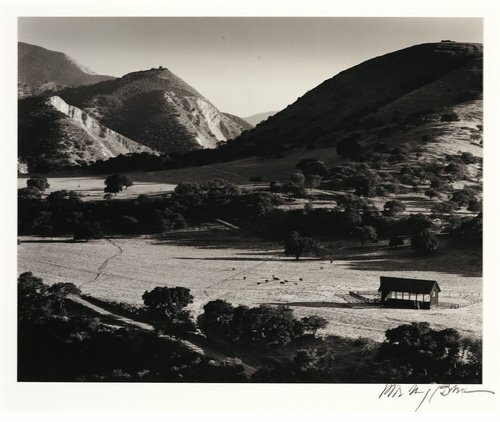 In the course of his architectural work, Baer often ventured into the agricultural valleys and canyons of the coastal mountains. Here he captures a well-known adobe ranch spread, with characteristic preciosity, the whitness of the buildings and drive contrasted against the dark shapes of the mountain ridge. 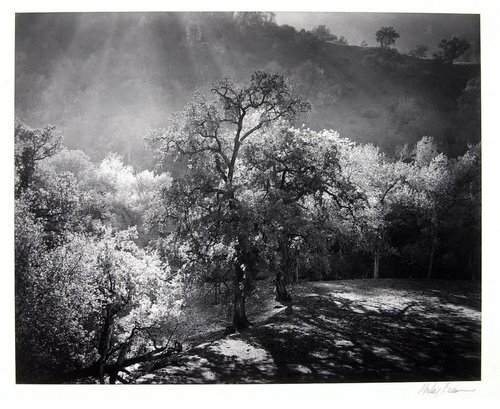 It's clear that Baer felt a sense of earthly power in the California landscape. Many of his studies have a strong, masculine apprehension of forces implacably set in opposition to man's appropriation, the movement of great forces under the earth, or from the sky, which contend in a scene at once majestic, and somewhat frightening. We stand in awe of the earth's (or nature's) capriciousness, though its movements and adjustments may be as quiet and satisfying as the slow movement in a Bruckner symphony. Bringing out these senses of scale and awesome range is often what Baer's prints seem to be about. 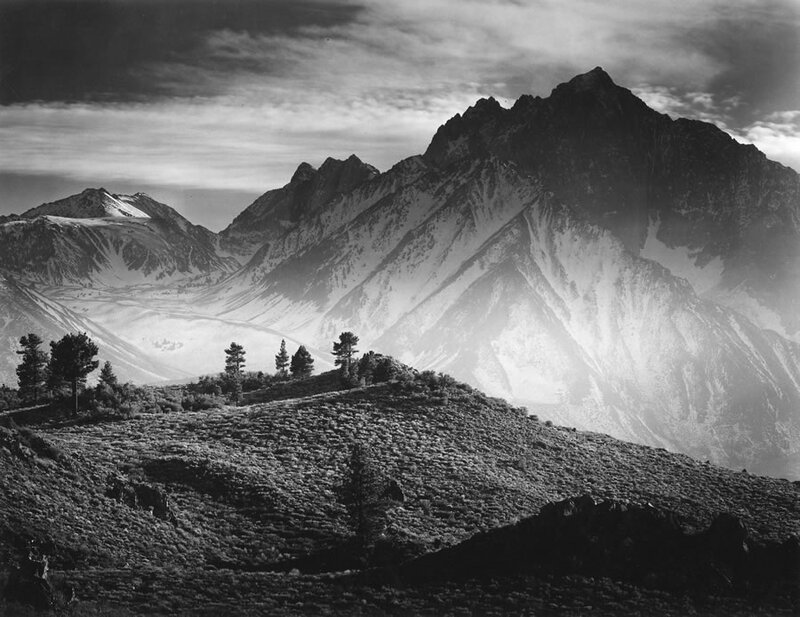 This is achieved through the contrast between a delicately rendered (and perfectly clear) foreground, and a yawning background fortuitously back-lit or highlighted with cloud windows. This study of rock and water is not an unusual subject--indeed, most of Baer's images aren't about finding the most peculiar or strained vantage from which to view a landscape scene--but its quality is like a brunt or shrug of geologic gesture. The rock flows, while the water seems icy, and still. The interposition of states of matter uses the deceptive contrast between kinds of textures to disorient the eye, and give interest. As with all Baer prints, there's a strong "interlocked" composition, founded and fixed. Though most of Baer's work in architecture is straightforward, occasionally he liked to make images of odd dilapidation or decay. 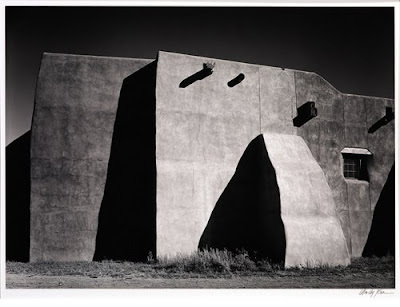 The disappearing rural architecture of the West captured his imagination. This storehouse structure has a weird "high-rise" effect which is completely disorienting in the context of its placement and construction. Baer was fond of dark skies, and this one undoubtedly was burned in deliberately to emphasize the heavy, overbearing quality of the ghostly presence. Baer's work along Garrapata, Big Sur, Carmel, and the Monterey Bay region may be the best examples of this genre. 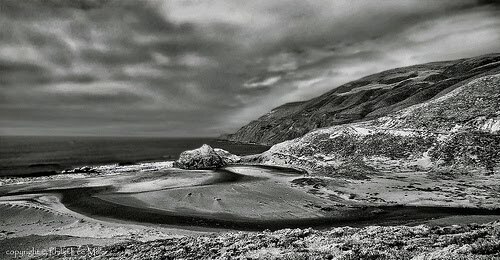 The combination of high contrast blacks with feathery light grey distances, is always used to create drama, and mystery. 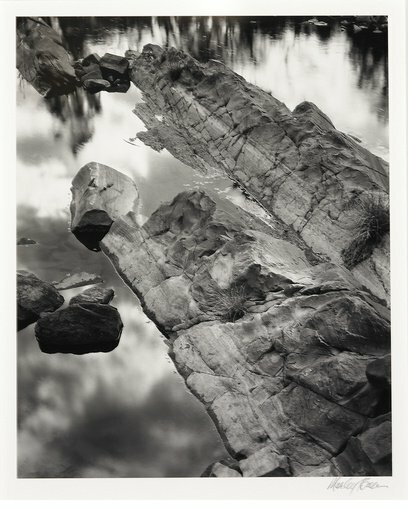 These compositions may seem easy and available, but it takes great patience, lots of work in the darkroom, and some luck as well, to make pictures like this. The light and clouds and wind seldom cooperate. Once, photographing along the Garrapata Creek area, I picked up a terrific case of poison oak that plagued me for a month. I'm sure that Baer must have known about this, and taken steps to protect himself. In my case, just handling the spikes at the end of my tripod was enough to infect me from head to toe! These aren't the usual tourist shots--because the "nature" they portray isn't welcoming and cheerful. They seem to be telling us that this country may be over-run, may be spoiled and defaced and polluted and poisoned, but it will never be tamed. That's the message with a lot of Baer shots: There's an ephemeral fragility which we can see here, but underneath that there are forces and movements which command our respect, as well as our appreciation of their inherent beauty and charm. Baer's images are contemplative and refined, serious and dry. But despite their classical balance and studied counterpoint, they're hardly reassuring or inert. The dizzying forces and poised relationships they capture are held in place by the shrewd augmentations of his art. You can feel Baer's character in all his images--he manages to define his purpose and convey his program with confidence and fullness of intention. This power of purpose has metaphysical persuasiveness which I find convincing, though this isn't the only kind of photographic style I admire, or enjoy. Baer's a "heavy" artist--rather in the manner that Ansel Adams often is. This muscular insistence can be very powerful, visually, like listening to Beethoven. No one likes Beethoven all the time, but we'd be poorer if we'd never known it. Baer's influence is apparent throughout the following two generations of print-makers. We all have our favorites, but there's no question that Baer's approach to landscape has tended to dominate the field. In many ways, he's the fulfillment of the movement which began with the f64 Group in the 1930's, and chronologically he stands in direct descent from that time, to this. Much of the landscape he's explored no longer exists, and his work thus occupies an elegiac position with respect to the progress of western expansionism and development. The post-cards of yesteryear become the nostalgic flashbacks of the future. As we use up the remaining unspoiled lands which men first discovered centuries ago, it's important to have records of what was lost in the process, even if the ultimate message is a sad one. This is what you had, and this is what you lost. Shame on you for ruining it. Even if your busy manipulations and "improvements" will someday be swept away by some conflagration or inundation of nature. All Photograph(s) seen here by Morley Baer. ©2012 by the Morley Baer Photography Trust, Santa Fe. All reproduction rights reserved. 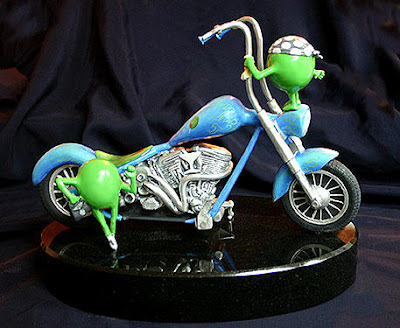 Images used by permission.